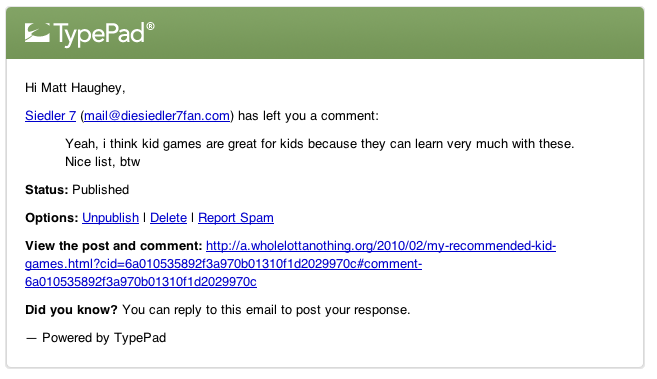 Does Amazon enable comment spam? Comment spam has been around for many years now and I've seen all the tricks of the trade blasted at me and my sites. Lately, it's gotten tougher and tougher to weed out every last bit of spam because it's clear comment spammers are hiring people to write somewhat on-topic comments and then loading either their username or the comment with links to their sites (which are loaded with ads). It's on topic, it seems like an innocuous pat on the back in broken english, but the username links to a video game fan site. The comment was posted to get a backlink to their site. Sometimes they copy and paste two sentences from my own post as a new comment, but usually it's a mellow "this is a good post" comment meant to fall under my radar and eventually improve their Google ranking for whatever keyword they are chasing. I started thinking about how people are farming out this "make an innocuous comment and link back to my site" work and I was reminded of Amazon's Mechanical Turk system where you pay humans to perform piecemeal work, often for mere pennies. A couple years ago, ReadWriteWeb noticed somewhat spammy activity on the Turk system so I decided to run the same searches today and found similar results. 29 results for "bookmark" including people asking for comments on their site and posting their site to every social bookmark system, some paying as little as a penny per job. 42 results for "comment" including lots of rate and comment my youtube videos up, test our comment system, and flat out "leave a good comment on my site" jobs. 18 results for "digg" including people asking digg votes as well as posting their site to digg for them. 13 results for "write a paragraph" These frequently become posts on adsense-loaded sites and other SEO nonsense. I'm sure there are bigger sites that enable these kind of bottom-feeder transactions on the web. I bet there are whole black hat SEO forums and marketplaces to buy links, comments, and articles, but it's kind of a shame that two years after ReadWriteWeb pointed out the problems they still persist. I love using Amazon as a customer and I think the Mechanical Turk system is pretty cool, I just wish they did a better job eradicating this kind of thing that leads me to have to judge all my incoming comments harshly as defaulting to spam unless they seem like honest additions to the conversation. I ordered this Philips 9″ LCD iPod/DVD/SD video player from Amazon a few days back for $99 and I’m astounded by how good it is considering the Amazon reviews. Right now, it has three and a half stars average and all the featured reviews are negative. I had an earlier iteration of this, a 7″ DVD player with a iPod slot that only fit two specific older iPod models. It worked great for the past year or two on road trips and plane trips, but the battery was so-so, the video screen was low quality, the picture quality was too bright and contrasty, and the iPod controls through the unit were buggy (I never could get widescreen video to play properly). It had a speaker but it was very small and very quiet and the whole thing was a clamshell design held by a flimsy hinge. The new model is pretty incredible. The screen is much better in terms of picture quality. At 9″ it is approaching laptop size. The battery is lithium ion and appears to be much better so far. The controls are nice and easy to use, widescreen video gloriously fills the picture. The new model has stereo speakers that do a decent, if tinny job. It fits not just older iPods but also most every new model including iPod touch, classic, and nanos. The iPhone will work, but it’s just barely too tall to shut the dock door and hide it completely. The stand on the back works great and the unit itself has a large substantial feel that is close to the personal video players you sometimes get on planes for an extra charge. I can’t wait to take it on my next plane trip for viewing movies and TV. I say this all not because anyone at Philips paid me to (they didn’t), but because the negative reviews for the unit rank so high in Amazon I doubt too many people have bought it. The whole thing reminds me of Louis CK’s famous bit last year about people being ungrateful about technology advances. This new model is ten times better than the old one but you’d never know it from the reviews. I also can’t believe this is only $99. It even comes with its own neoprene case! I gladly give this five freakin’ stars.